Stanley Thompson, the premier golf course architect of the 1920's and holder of the course record at the PETERBOROUGH GOLF AND COUNTRY CLUB, was engaged, 1929 - 1931 to design an 18 hole layout. 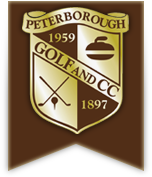 The Peterborough Golf and Country Club has a formidable history featuring many of Ontario's greatest golfers. But you don't have to be a champion to play 18 holes in under four hours on our Stanley Thompson designed, walkable golf course. Our par 71 course with it's a diverse mixture of mature trees and spectacular views of the Trent Canal offers members a player-friendly layout. Golfers of all abilities have the opportunity to challenge themselves. At the Peterborough Golf and Country Club, our innovative Personalized Membership Plan allows you to choose the level of membership that suits you best. There are no restrictions on advanced tee time bookings and no blackout periods regardless of your membership level. We have a variety of leagues for all levels of play and our PGA of Canada Professionals will help you to improve your game with custom club fitting and lessons. All members have full use of our practice facility where you can warm up, refine your skills or spend an hour on days when your time is limited. Members also enjoy reciprocal privileges at a number of area clubs. CLICK HERE to access our Golf Memberships.